The fact that housing did not benefit from the balmy weather really calls into question the widespread notion of their being a significant real estate recovery on our hands. Note that the raw data for the past two months were the second weakest for any January or any February on record — and the records go back to 1963! The levels of the raw data were even below the January (24k) and February (29k) levels at the depths of the Great Recession in 2009. While the median and average prices both advanced considerably (from $215,700 to $233,700 for the median, an eight-month high; and from $261,900 to $267,700 for the average. a seven-month high). this reflected greater sales activity in the $200k-$300k range, which accounted for a record- high 41% share of total sales (up from 31% in January). The builders sold fewer units in the sub—$150k category (a 13% share, down from 21% in January and the lowest in eight months). Moreover, because sales managed to rise 14.3% in the Northeast (maybe there was a weather effect after all) and this is the most expensive region (home prices are 60% above the national average), there was a regional skew to the home price data as well. So it is really doubtful that there is any pricing power in this space. particularly seeing as the unsold inventory is edging up again to a three-month high of 5.8 months’ supply from 5.7 in January and 5.5 in December. Moreover, it is still taking the builders a median of 7.6 months to make a sale following completion of the unit. Before the housing market went bust in 2007, a number north of five months was practically unheard of. 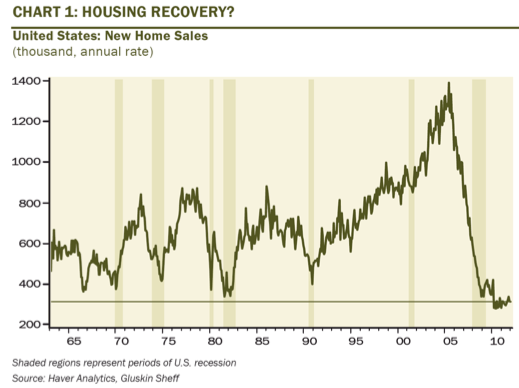 This speaks to the lack of overall demand strength despite the vast improvement in affordability.